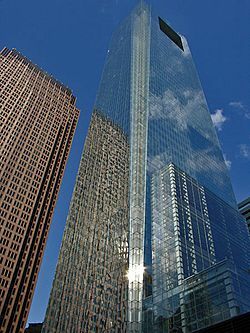 Comcast's headquarters (Comcast Center) in Center City, Philadelphia, Pennsylvania. Comcast Corporation (formerly registered as Comcast Holdings) is an American global telecommunications conglomerate that is the largest broadcasting and cable television company in the world by revenue. It is the second-largest pay-TV company after AT&T, largest cable TV company and largest home Internet service provider in the United States, and the nation's third-largest home telephone service provider. Comcast services U.S. residential and commercial customers in 40 states and in the District of Columbia. The company's headquarters are located in Philadelphia, Pennsylvania. As the owner of the international media company NBC Universal since 2011, Comcast is a producer of feature films and television programs intended for theatrical exhibition and over-the-air and cable television broadcast. Comcast operates over-the-air national broadcast network channels (NBC and Telemundo), multiple cable-only channels (including MSNBC, CNBC, USA Network, NBCSN, E!, The Weather Channel, among others), the film production studio Universal Pictures, and Universal Parks & Resorts in Los Angeles, California; Orlando, Florida; and Osaka, Japan. Despite being publicly traded, Comcast is a family-owned business, with the Roberts family owning a 33% controlling stake and multiple generations serving as company executives. Comcast is sometimes described as a family business. Brian L. Roberts, chairman, president, and CEO of Comcast, is the son of co-founder Ralph Roberts. In 2010, he was one of the highest paid executives in the United States, with total compensation of about $31 million. Comcast Facts for Kids. Kiddle Encyclopedia.